Make Trails & Sails Last All Year Long! As a member of Essex Heritage you will have many opportunities to connect to resources in this region. In September Trails & Sails offers hundreds of opportunities to explore the region, but membership makes the fun last all year long. Your connections to place foster stewardship enriching both your life and ensuring the longevity of the natural, historic and cultural treasures here in Essex County, MA. Enjoy Essex Heritage event as well as featured partner events. Both offer special Essex Heritage membership rates to attend, just let them know you are a member! Join us and experience the best of the region throughout the year! I reported in this blog last week that the Annual Fall meeting of Essex Heritage was held on November 8, 2012, at the Historic Smith Barn in Peabody, after it was postponed last month due to the arrival of Hurricane Sandy. The weather was still inclement as we were in the middle of a late fall nor’easter storm. In light of a continuing period of adjustment with a new prosthetic leg, the storm and unexpected snow on the ground, I decided to pass on attendance at this public meeting. Marge and I were advised that this was a good decision as the conditions around the location of the meeting were not acceptable for a man operating on an artificial leg. The meeting progressed as planned and attendance was excellent with over one hundred in attendance, and the meeting included many local elected officials, both past and present. Considering the earlier postponement of the meeting and the weather conditions that morning of the rescheduled meeting everything was well received and presented. The meeting and its agenda was directed by current Essex Heritage President Rich Yagjian of Hunts Photo and Video of Melrose who provided information on a number of very effective programs being offered. An all-inclusive presentation on the state of the Heritage Area was provided to all in attendance by Essex Heritage Executive Director Annie Harris. The commission was addressed by recently re-elected Congressman John F. Tierney. Over the most recent period several new local businesses have joined the Corporate Support Program and the names of those participants were displayed to thank them for their ongoing support. The companies can also be found on the Essex Heritage Web Site at www.essexheritsge.org. National Park Service Superintendent, Michael Quijano-West, head of Salem and Saugus NHS also addressed the meeting. He reported on the ongoing programs that Essex Heritage and the National Park Service are working on together. · Julie Saviano, Andover Endodontics, Inc. I want to note that the new Commissioner Mark Leonard, from Eastern Bank, is my son. I am very pleased that my family will continue to have representation with Essex Heritage if, for any reason, I have to end my connection with the Commission. We continue to monitor and applaud activities and consolidations that might result in real savings for the management of our local communities. Mayor Ted Bettencourt is about to merge two positions in the City of Peabody that on the surface certainly seems to be a great attempt to save funds. The City will merge the current positions of Director of Human Resources for the City and the School District into a single position that could result in a an annual savings of between $70 and $85,000. Congratulations Mayor on your initiative! All of the work that needs to be done on the Danvers Swamp Walk in Danvers is nearly complete. A wooden walkway has been built over a forty-seven acre marshland off Locust Street in the northern section of town. Recently, a team of volunteers completed the final 1421 ft. section of the walkway. This project is a wonderful addition to the recreational assets of the Town of Danvers as the facility connects with the recently completed the Rail Trail. The walk will also be used as an education tool for the Danvers schools. This walkway a wonderful addition to the resources of the community now and for future generations. The Topsfield Library is now offering on-line courses that enable residents of the community to complete course for school credit at their own pace. This a wonderful resource offered by this community facility, and I am certain that this effort will be appreciated. In 2012, the Old Town Hall in Salem is getting good use. In an earlier blog posting, I told you of the use of that facility for the Salem Winter Farmers Market through the end of the year. Now the Salem Partnership will hold its annual holiday party for members at this location. When we first moved to Danvers, after a very brief period of assessment, we picked St. Richard’s Church as the church where we would worship weekly. We have been very active during these last 35 years and have been involved as a member of the Parish Council, as a lector at weekly services, and other participation. The church was about fifteen years old when we arrived in Danvers and in 2013 the church will celebrate its fiftieth anniversary. The Parish will celebrate its anniversary with a series of celebrations including a mass and a gala. Marge and I are proud to have been asked to serve as Honorary Chairpersons of the yearlong event. We have begun our participation by contributing two tickets to a Patriot vs. Dolphins game. These tickets will be offered through a raffle to parishioners who sign up to volunteer as workers at the various events that have been planned. The proceeds from the ticket raffle will help to underwrite various events. Next month a concert will be performed by the North Shore Philharmonic Orchestra on December 9, 2012. The concert like the event last year is free and the only price of admission is a bag of non-perishable groceries All of the food collected and it is a voluminous total is presented to the local Danvers People to People Food Pantry. As more events are offered during the upcoming year, we will alert readers of this Blog. One night this past week, Marge and I attended a performance of Guys and Dolls at the North Shore Music Theatre. We expected it would be very good and it certainly was. The acting was great and the music was wonderful. The singing and dancing was exceptional. We have seen the show performed before and this session was a good as we have seen. This was our third trip to the NSMT this year, and all of them have been very pleasant experiences. For a number of years we were season ticket holders at this superb community arts institution until the theater folded. While we were visiting the theatre for this recent show, we made the decision to once again purchase season tickets for coming year. Our decision was made because the present ownership team seem to have their “act together”. The NSMT has a wonderful handicapped seating section and our new tickets are in that part of the theatre. The playbill for the 2013 season appears to be most promising, and we are looking forward to viewing the shows we have purchased. Mr. Ken Hanover the CEO of Northeast Health (Beverly Hospital) will resign from his position as a result of the merger agreement between Beverly Hospital and Leahy Clinic. The present CEO of Leahy Clinic, Dr. Howard Grant, will become the CEO of the combined hospitals. It is a couple of days after the 2012 Election and the results are most interesting. President Obama #44 has won four more years leading this country. I will leave it up to the mainstream media and political pundits to provide analysis of what this election may mean to all of us, but the President Obama has a major job in front of him, as he works to unite the country with the control of the two houses of Congress still split between Republicans and Democrats, at about the same level as before the election The Massachusetts US Senate race produced a new player to represent the state, Elizabeth Warren, and I suspect that the loser in that race, Scott Brown, will be heard from again in the future. In Danvers, where I reside, State Representative Ted Speliotis won re-election and will continue to represent our community for another two years. In another local race, Joan Lovely, a City Councilor from Salem, won the State Senate race replacing the retiring State Senator Fred Berry. Joan will represent Danvers as well as other communities in this region In Salem and Beverly the Community Preservation Act was passed by the voters and it could have a very valuable impact on preservation, recreational and affordable housing projects in those two communities, similar to what has taken place in the City of Peabody. The Boston Sports Museum that operates of the TD Garden is now taking on new challenges in addition to highlighting the people, the places and the events that help make up the sports history of this area. The museum highlights the history of the sports icons and the games that they played and provides a wonderful venue to take us back in time to play the sports moments of the last several decades as we use the facility to refresh our memories of the better sports moments over the years. Now in addition to those tasks that they have undertaken, they have identified an even more topical and hurtful topic to bring them current in today’s world of sport. They have produced a film on the dangers of being a bully in today’s environment. They expect to distribute this topical film to high school students around the region. Using this new piece of media, they hope to awaken today’s young athlete on the damages that can be done to their contemporaries. Good luck to them in their new effort. It is long overdue and could have a measurable impact on the bulling issue. As a hockey fan, it was good news to hear that the two sides have once again begun to talk about enduring the lockout. There is still much to be accomplished before we can expect to see a conclusion to this issue. The parties are at the very least talking which is a plus. I certainly hope that the timing of the postings on this Blog does not preclude me from wishing you and your families a Happy Thanksgiving. We are now in the middle of the long holiday weekend that helps us get together to celebrate the most American Holiday of the year. If you gathered to attend one of the great community football events contested in this region at this time of the year, or participated in one of the many road races that are fast becoming holiday traditions in this region, we certainly hope that the holiday was a most pleasant one for you and family. The local football events could be a thing of the past after his year as a new playoff system will be tried next year. The letter in the Salem News highlighted many of the wonderful gifts that have been made to local organizations that provide support to overcome violence against women. The cause that was highlighted in the letter was Annette’s climb that was established a decade ago as a climb up Tuckerman’s Ravine to the summit of Mount Washington in New Hampshire. I did not know Annette Soares very well, but her death was certainly a tragedy to her friends and particularly her family. The family was a neighbor of mine when I first lived in Danvers and I coached hockey with her dad, John. They have done a wonderful job of turning the untimely death of a family member into an event that honors the memory of their young daughter and at the same time has turned the event into a major fundraising event that benefits many organizations working to prevent similar events. The original organizers of the event and now the continuing group of volunteers pursuing the cause should be applauded for their efforts. The event started as a friendly hike to honor the memory of a local young lady from Danvers who was murdered by her boyfriend. The event has now reached a milestone as $300,000 has been raised since the events inception. Then the walk provided donations to charities in the region that provide support to organizations like HAWK in Salem and the Women in transition Program offered at the North Shore Community College that helps support programs that protect women from acts of violence. In the very last days of October, we all experienced a very difficult time with a storm that in many cases ravaged many of the northern Atlantic coastal states. The potential of the storm was heralded in all kinds of media resources and like a lot of the previous “Storms of the Century” that failed to live up to expectations; in reality, Hurricane Sandy unfortunately performed as advertised. The images we have seen of the area where the storm made landfall were devastating. The Jersey Shore took a direct hit and the floods, fires and damages to national landmarks like the boardwalk in Atlantic City, built in 1890, may never be replaced. In addition to the boardwalk, a replica three mast sailing ship, the HMS Bounty, similar to the National Park Service’s tall ship Friendship in Salem, was lost along with her captain. Last summer the HMS bounty visited the historic port of Newburyport. The five boroughs of New York and many of the New Jersey shore bedroom communities were devastated. It will be some time until “the city that never sleeps” recovers. It is now coping with no power, a flooded subway system and limited travel capabilities. It will take some time for New York and the Connecticut and New Jersey shore communities to recover from this “once in lifetime” hit by Mother Nature. The southern New England coast and many communities along our treasured coastline from Gloucester and Plum Island to Cape Cod were hit hard. The damages would have been much more severe if the eye of the storm had moved just a couple of hundred miles further north and hit the wonderful resources in this state in an even more critical manner. We truly feel bad for our neighbors to the south and will offer what help we can provide, but are most grateful that the area just north and south of Boston were spared from an even more devastating loss of resources. I expect that the remarks offered here might be better served in my usual section of my personal observations, but the implications of what might have happened has caused me to offer my observations on this subject right at the front of this presentation. We are very pleased to announce that the Salem Rotary Club, with its long record of generous support to organizations in their home community and throughout this region, has agreed to become a Corporate Member of Essex Heritage. We thank them for their generous support for our mission. Salem Rotary provides exemplary assistance to so many organizations in this region. Essex Heritage held its Annual Fall Meeting last Thursday, November 8 at the historic Smith Barn in Peabody. The barn is part of the old Felton Farm which is operated by the Peabody Historic Society. The meeting was originally scheduled to be held on October 30, 2012, but had to be rescheduled due to the unwelcome arrival of Hurricane Sandy. We are glad that we delayed this event as a fallen tree on the way to the Smith Barn would have made access difficult. There was a moment of silence in recognition of the recent passing of a significant contributor to the life of the region - Glenn Mairo. Glenn was a resident of Boxford but made his impact mainly in Danvers as the founder and director of the Essex Harmony, an acapella vocal ensemble from Danvers that performs music of the "singing school" period of late 18th and early 19th century New England. Glen also held the title of Educator of the Danvers Historical Society as well as serving on their Board of Trustees. A true lover of music, history and education, Glenn committed himself to teaching hundreds of Danvers school kids a love of knowledge and history. The audience was asked to mark the passing of such a dedicated individual who has made such a difference in this area. Glenn Mairo – he is greatly missed. At the meeting, an Essex Heritage Special Recognition Award was presented to Lindsay Diehl formerly of the Wenham Museum. After six years as the Executive Director and many more years of experience at the museum from visiting as a child to serving as Marketing Director as well as Interim Director, Ms. Diehl announced her retirement earlier this year. Ms. Diehl led the Wenham Museum through many improvements during her tenure as Executive Director. In 2006, flood damage from the Mother’s Day storm could have been devastating but Diehl was able to navigate with her team through the economic recession. During her term the museum saw increases in visitation, programming, membership, and regional awareness as well as improvements in the care of collections and financial stability. Lindsay Diehl is an outstanding leader and we were extremely pleased to present this Special Recognition Award for her efforts. Much like the famous 1912 Bread & Roses strike itself, the passionate work of the Bread & Roses Centennial Committee has brought international attention to the City of Lawrence, Massachusetts. To suitably honor the textile workers’ strike that became one of the most significant flashpoints in labor history, a partnership of four organizations: the Lawrence History Center, Lawrence Heritage State Park, Bread & Roses Heritage Committee, and University of Massachusetts at Lowell joined together to lead the centennial planning effort. Together they organized an ambitious mix of commemorative activities to bring attention to their city. The committee’s efforts inspired a host of additional cultural activities related to the centennial. In sum, this partnership’s collaboration, dedication and energy created a great deal momentum in the city by boosting academic research, tourism, and community pride. This committee and its work was nominated for this prestigious award by Heather McCann of Groundwork Lawrence and Chairman Robert Forrant of UMass Lowell and the Bread & Roses Centennial Committee were provided one of the the important Essex Heritage Pioneer in Partnership Awards. Captain Rutstein is the Owner and Operator of Schooner Fame and he has also developed a program with the National Park Service to offer curriculum based sailing experiences to Salem youth. The program is called “Salem Sets Sail: Ships, Sailors and the Sea,” and it combines dockside programming along with a chance to climb aboard The Friendship of Salem as well as Schooner Fame to gain hands-on sailing experience. Over 600 local schoolchildren have been able to sail in Salem Harbor as part of this program. Captain Rutstein also works with local teachers and has developed professional workshops and training for National Park Service staff and volunteers. He and the crew of the Fame are providing the children of Salem with a wonderful opportunity to dive into the historic and natural world and become the next generation of our region’s heritage stewards.Captain Mike Rutstein was nominated for the award by Maryann Zujewski of the National Park Service and we were pleased to present the award. This past June, following years of public debate, some of it acrimonious, the Town of Danvers celebrated the opening of the Danvers Rail Trail. The day not only marked the completion of a 4.3 mile trail linking Danvers to Wenham, Topsfield and Peabody but the coming together of many partners around the idea of creating a better community. The Pioneer in Partnership Award recognized the Danvers Rail Trail Advisory Committee’s leadership and commitment to developing a popular recreational amenity that has instantly improved the quality of life in Danvers and the greater region. Their accomplishments include creating a 60-page trail development plan, communicating with abutters, being the first in Massachusetts to partner with the Iron Horse Preservation Society to build the trail in exchange for the salvage rails and installing safety mile markers and interpretive signage. Through it all, the committee has honored the historic connection between the railroad and its role in the development of Danvers. The committee was nominated by Kate Day from the Town of Danvers. Chairman Charles Lincicum and the Danvers Rail Trail Advisory Committee were presented a 2012 Pioneer in Partnership Award. For the last nine years, Tom Kolterjahn and Karen Holt have led the Newburyport Powder House Restoration Project Committee, devoting countless hours of time and personal commitment. Without their combined passion and perseverance, there is no doubt that this project would not have been realized. When we look at the 1822 Powder House on Godfrey Hill, we should be reminded not only of Newburyport's military history, but also of Tom and Karen's vision to preserve that history for our community for years to come. Following conveyance of a 99-year lease from the National Guard and the Commonwealth of Massachusetts to the City of Newburyport, the committee was able to enlist help, much of it donated, from some of the region's most respected historic building specialists and craftsmen. The scholarly restoration was informed by extensive archival research, archaeological investigations, and even laser imagery. Project funding came from numerous public and private sources including Essex Heritage, the Newburyport Community Preservation Act, the Mayor Gayden Morrill Charitable Foundation and the Commonwealth of Massachusetts. With much acclaim, the Powder House was re-dedicated this September 23rd as the Powder House Park and Learning Center, and now serves the community as an educational and as a tourist resource for all ages. Karen and Tom were nominated for the award by State Representative Michael A. Costello and accepted the award with gratitude and thanks to all else who helped mark the effort. The Gables is much more than this a famous National Historic Landmark. The founder of the Gables Settlement Association, Caroline Emmerton, had a vision that was focused first and foremost on providing social services to immigrant families. Since 1910, the Gables has concentrated on aiding the local under-served population of Salem, and Anita Blackaby, the current Executive Directo,r has continued this mission. Last spring, Essex Heritage teamed up with the Gables to apply for a National Park Foundation grant to look at ways to engage Salem’s Latino youth in the history and heritage resources in their neighborhood. Places like the Salem Maritime Site, the Peabody Essex Museum and the Gables - which have a shared history with the Caribbean stretching back more than 200 years. The 15 boys and girls who participated last summer learned much and became much more familiar with this area – and in turn, we learned a lot from them too – about their history and their experience as immigrants to this region. The program is continuing this fall – after school at the Bowditch Elementary and Middle School. The Gables has been a wonderful partner in this venture and we together have had great success. Anita Blackaby attended the meeting to accept the Essex Heritage award. 115 Derby Street, Salem, MA 01970. Pianist Jacquelyn Schwab will perform vintage 19th century American parlor music, including Stephen Foster and Civil War songs, hymns, spirituals, and ballroom dances. Schwab is best known for her performances on Ken Burns’ Grammy award-winning Civil War documentary, as well as the Emmy award-winning Baseball and Mark Twain documentaries on public television. A folk and classical improvisational pianist, she has a unique style that defies easy categorization. Advanced reservations required. Essex Heritage and Seven Gables Members $10; Non-Members $15. To reserve, please contact (978) 744-0991 and let them know you are an Essex Heritage member. Richard Yagjian: Rich, the President of the Essex National Heritage Commission and the Executive Vice President and Chief Operating Officer of Hunts Photo and Video located in Melrose, was recently tapped by Massachusetts Governor Deval Patrick to become the Chairman of the Board of the North Shore Community College of Danvers and Lynn. Richard Yagjian of Peabody has assumed the Chairmanship of the College’s Board of Directors that he has served for the past three years s a member. Previously, Yagjian had served as President of the Board of the College’s Foundation that acts as a fundraising organization. I am proud to have also served for many years in this effort for the college and recognize the work he accomplished for the College. I have also had the good fortune to see the commitment offered to Essex Heritage by Rich as he presented the idea of the Essex Heritage Photo Safari’s and turned it into an active, well attended Commission Program. Rich has played an important role in helping to bring the important community of Peabody into an active partnership with Essex Heritage. The Town of Essex has designated a section of the downtown on Route 133 adjacent to the Essex River as one of the states four new cultural districts due to the concentration of facilities, activities and assets in the region. One of the purposes of the District is to expand tourism and expand cultural enterprises, encourage business growth, preserve and reuse historic properties, and enhance property values and foster cultural development. 1. Operating Results. For the first two months of FY 2013, we are reporting a deficit of ($147,200) on revenue of $1,992,300. We do expect to operate throughout the year to end up with breakeven results. We do expect to incur monthly deficits during the first three months of the fiscal year due to a diminishment of revenue from federal sources as the federal fiscal year comes to a close. 2. North Shore Elder Services Annual Meeting - The Annual Public Meeting of North Shore Elder Services was held on Wednesday, October 24, 2012 at the DoubleTree Hilton Hotel (formerly Coco Key) in Danvers, MA. State Representative Steven M. Walsh, House Chair, Joint Committee on Health Care Finance, was the keynote speaker. His topic was the recently enacted Health Care Reform Statute and what we can expect on the North Shore. The following amendment was made to the By-Laws: The position titles “President” and “Vice President” were changed to “Chair” and “Vice Chair”. Tickets as well as sponsorship opportunities for this dinner event are available at http://wegivethanks2012.eventbrite.com/# or by contacting Rhonda Gauthier, 978 624 2220 / rgauthier@nselder.org. · Barbra and Frank, The Concert that Never Was, a sensational tribute to Sinatra and Streisand as seen in Las Vegas starring “two of the most impressive celebrity impersonators in the business” and featuring a six piece concert band. Saturday evening, October 12, 2013. Ticket and sponsorship information will be available in December. National elections occurred this week and polling stations around Massachusetts welcomed millions of voters. Voting is one of the most fundamental rights granted to American citizens, but as many as 3 million Americans with disabilities are "sidelined" on election day. The good news is that federal and state law provide important protections for disabled voters, and Massachusetts voters with disabilities and their advocates need to be aware of community resources that are available to protect the exercise of this fundamental right. Make sure to know your rights. In this fall season of the year, Salem with all of its Halloween trappings is a great place to visit even into the early days of November. For the most part, the party revelers are gone, but the city still remains wonderful place to visit and the showing of the Essex Heritage presentation Salem Witch Hunt: Examine the Evidence as described below can be a most entertaining and informative way to spent a relaxing time. The presentation is provided several times a day at the National Park Service Visitor Center across from the world famous Peabody Museum and adjacent to the City Parking Garage. Enter a date in your calendar to visit this most entertaining show. 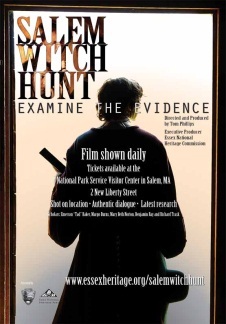 Presented by Essex Heritage and the National Park Service, Salem Witch Hunt: Examine the Evidence features authentic dialogue and the latest research by renowned Salem Witch Trial scholars. Scenes depicted in the film were shot at actual locations associated with the Witch Trials of 1692. The sites can still be visited today. Information on how to visit the sites is available at the main desk of the National Park Service Visitor Center in Salem, MA. Danvers Archival Center; with special thanks to NPS Park Historian Emily Murphy, PhD. Essex Heritage is pleased to announce that following corporations have the joined the Corporate Membership Program. Their participation and support is important to the success of our primary mission to preserve, protect and promote the historical, cultural and natural resources of Essex County. These organizations are wonderful examples of great Essex County resources. · North Shore Music Theatre: Since 1955, NSMT has become one of the most attended theatres in New England with approximately 250,000 patrons annually. With a national and regional reputation for artistic achievement, NSMT has received numerous industry awards including Elliot Norton Awards, IRNE Awards, the Rosetta Le Noire Award from Actors’ Equity, and the Moss Hart Award. Under new ownership since 2010, NSMT continues to annually produce a musical subscription series and an annual production of A Christmas Carol along with celebrity concerts and children’s programming. · Salem Witch Museum: The facility located across the Salem Common from the Historic Hawthorne Hotel. The three dimensional show takes visitors back in time to 1622 and is one the most visited venues in this historic community. It is particularly busy during this time of the year. The Salem Witch Museum brings you back to Salem in 1692. Experience the drama of history in life-size stage sets. Saturday, November 3: As a resident of the Town of Danvers and an active member of the Danvers Historical Society I have been pleased to be at several presentations provided by Essex Heritage Commissioner and Town of Danvers Archivist Richard Trask and have found them all to be entertaining and informative. Take advantage of this Essex Heritage event and register for this Behind the Scenes Tour of the Danvers Archival Center, Peabody Institute Library of Danvers, 15 Sylvan Street, Danvers, MA 01923. The Archival Center houses a wonderful and diverse collection of materials that relate to the history of Salem Village and Danvers from the 17th century to the present, including many public, church, and private records related to the witchcraft trials and life in Salem Village. Learn about the significance of the Archival Center as our knowledgeable host spotlights some of the valuable and historically important materials that directly relate to our local, regional and national history. As seen in the film Salem Witch Hunt: Examine the Evidence, the tour will also highlight some of the Archival Center’s rarely seen items and artifacts. Reservations required. Essex Heritage Members $7; Non-Members $10. Please register online or call Essex Heritage at 978-740-0444 for questions and details. Event fees sustain the Essex Heritage Membership program and support partner sites. In years gone past, the City of Gloucester used the wind as an asset as it helped move fishing vessels as they provided residents of that community and others in the region. Now the Town plans to use the winds that move through that community to another but equally valuable service. A company that operates in the Blackburn Industrial Park, Varian Semi Conductor Company and industrial partners are in the process of erecting a 2.5 megawatt wind turbine that will rise nearly 500 feet from the base to the paddles on the top of the turbine. The cost of this investment is eight million dollars. By mid-December, it is expected that two additional turbines will be built in the same general area. This location is thought to be one of the finest locations in northern Massachusetts to utilize wind power. The location is in a wooded area close to Route 128 but away from residences and the general population. The other two turbines that will be erected will be owned and operated directly to benefit the City of Gloucester. The Mayor of the community applied to the federal government for a grant that was awarded, and when complete the two municipally owned turbines will produce enough energy to completely satisfy all of the present needs of the municipality in the future. The reduction in electricity charges could amount to over $10 million over the next fifteen years. With those savings and the utilization of the power from those sources should allow the community to claim that they are one hundred percent powered by renewable energy for all of their energy needs including schools and other municipal buildings, streetlights and other needs. There is an extra benefit to using wind power to serve the community rather than with fossil fuels as the environment will be substantially cleaner. This could be a wonderful long-term asset for the community of Gloucester and give them a continuing leg up on comparable communities in this region. Mayor Kirk looks like a real sear as she implements her plan. A most highly contested election day is coming up quickly into our consciousness. On November 6, 2012 all registered voters in this region will be asked to cast a vote in your local community for the candidates of your choice. We encourage you to vote for the persons of your choice on Election Day. We are most confident that whomever is chosen will work with the Essex National Heritage Area and together we will continue to move this initiative forward. EBSCO Publishing, working with officials from the Town of Topsfield, cleared a trail through the woods behind its Boston Road Office. To help complete the project the Company last month purchased and installed exercise equipment and picnic tables adjacent to the trail. This is a project that most certainly fits with the strategies of Essex Heritage which calls for the expansion of trails in this region. There are a number of Farmer’s markets that are most successful and one of the oldest and most accessed is the one offered in Salem adjacent to the Old Town Hall every Thursday. Now starting on November 1, 2012, Salem will start a second season inside on the first floor of the Old Town Hall. This second season will operate on every Thursday except Thanksgiving Day for eight weeks through the end of November. In Thanksgiving week the event will be held on Tuesday on the usual time schedule from 3 until 6. It is that time of year again -- time to reassess whether your Medicare plan is working for you. Medicare's open enrollment period runs from October 15 to December 7. During this period, you may enroll in a Medicare Part D plan or, if you currently have a plan, you may change plans. In addition, you can switch out of a Medicare Advantage (managed care) plan and return to traditional Medicare (Parts A and B), enroll in a Medicare Advantage plan from traditional Medicare, or change Medicare Advantage plans. If you are in traditional Medicare, are happy there and don’t have or want a prescription drug plan, you don’t need to do anything. Beneficiaries can go to www.medicare.gov or call 1-800-MEDICARE (1-800-633-4227) to make changes in their Medicare prescription drug and health plan coverage. During the open enrollment period, you should review your current plan by looking at the costs and coverage for next year to determine if it is still the right plan for you. It is especially important to shop around for the best drug plan. The Washington Post is reporting that prescription drug plan premiums are expected to go up significantly. According to an analysis by Avalere Health, seven of the current top 10 prescription drug plans will have double-digit increases in premiums. In addition, you can now get the same information found in the handbook "Medicare & You" online. Find out what’s new for the year, how Medicare works with your other insurance, get Medicare costs, and find out what Medicare covers. The handbook information on the Web is updated regularly, so it will always find the most up-to-date Medicare information. Now that the region has experienced it is first below freezing evening and a killing frost, we have seen both good and bad news. The bad news is the end of the growing season in the region, but the good news is that the frost has been a positive as the Triple E danger from mosquitos has diminished. This is good news for local school administrators that have adjusted outdoor events because of the dangers. North Shore Elder Services presented its Annual Public Meeting on October 24th at the Double Tree Hotel in Danvers. The meeting is held each year to provide updates on NSES as it interacts with the local communities in this region. The keynote speaker at the meeting was State Representative Steven Walsh who represents Lynn in the legislature and is the Chairman of the Committee of Health Care Financing. Representative Walsh, who has also worked closely with Essex Heritage on its mission, provided update on “What we can expect on the North Shore.” He spoke in some detail on the expected needs in information systems currently in use in the health system and how far that industry is behind other industries in improving information technology in the health arena. He spoke of the need to streamline conditions and noted that we more than likely had too many beds being offered by community hospitals in this region. He also took some questions from the audience that concerned both the drug lab in Framingham and noted that clearing up the problems that will exist as a result of the problems in the State’s drug testing laboratory and how much effort and financial resources will have to expended by the State to clear up the deficiencies exposed in that scandal. Executive Director Paul Lanzikos, who reviewed the activities of NSES during the past year, made a presentation to the group. He spoke of the work of NSES with the Over the Rainbow Group and advised that the subsidiary, The Longevity Connection, that provides services to seniors that want to remain in their present homes, wants to offer a tour of the facility and visitors can learn what is happening at the center at an open house, all day on December 5, 2012. An open invitation was extended to all in attendance and other interested parties. There will be people to answer questions and light refreshments will be served. An overview of the “We Give Thanks” awards dinner on November 15, 2012 at Spinellis in Lynnfield was provided and tickets for the event are still available by contacting North Shore Elder Services at 978 624-2220. I am most pleased that my wife Marge will be honored at this event as the caretaker of the year, for her work looking after me and aiding in my recovery. A report was offered on the connection outstanding with the North Shore Music Theatre and two dates for events scheduled in 2013 were identified. In 2012 a most successful fund raising event was held at the theatre, and next year two events on 4/27 and 10/12 will be offered to assist the work of North Shore Elder Services. Town Administrator Wayne Melville announced his retirement effective January 4, 2013 from his position at Manchester-by-the Sea. He has been in Manchester since 2006 and worked in this field since 1983. The nation’s oldest regional land trust, the Trustees of Reservations recently honored Andover resident Al French with a Life Trustee Award for his many years of commitment to the Bay Circuit Trail and Greenway Project. French has announced his retirement as Chairman of the project. We were pleased to learn that the Kelly Automotive Group has provided a most generous contribution of $25,000 to assure that a Boys and Girls Club of Greater Salem project would continue at the Higgins Middle School in Peabody. The Program that was started several years ago through the efforts of Greg Passeri, a teacher at the school and a former summer instructor at the Salem location, will now continue. The program had to be curtailed in Peabody as funding at the Salem operation became difficult to commit because of a number of reasons. Now thanks to the efforts of Brian Kelly the program in Peabody will continue to be offered. Kelly gathered the money to offer the generous contribution by allocating $50 from the sale of every vehicle sold to Peabody residents to a fund to keep the program active. Many thanks to the Kelly Automotive group for their commitment to the Higgins Middle School student who attend this valuable program offered by the Boys and Girls Club Of Greater Salem. The local communication sources, government agencies, and the utility companies seemed to do an excellent job of preparing for the late October storm that went back and forth between a hurricane and a large tropical storm. As this report is prepared, it appears that the storm will come inland somewhere on the mid-Atlantic coast and New England will be spared a direct impact from the large storm, but it is still early on Saturday morning and things can change and it more than likely it was positive that we took precautions early. Most of the material put away was summer uses like boats, lawn ornaments and outside chairs etc., and it was time to get those things stored away anyway.